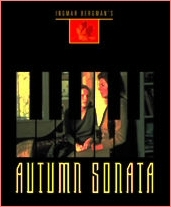 Stacking the deck against Ingrid Bergman in Autumn Sonata, director-writer Ingmar Bergman doesn’t give viewers an escape except to laugh it all off. Meant to be a searing exposure of parental sins, yet when we’re watching in excruciating close-up daughter Liv Ullmann berate Ingrid for her long list of motherhood transgressions, little choice is left but to yell, “Give us a break!” As the Sins of Ingrid are cataloged, the director, already biographically transparent, perhaps accidentally puts us on her side; we cheer her on when she plots to flee Liv’s domain of dreary dramaturgy. In her ultra-neat Swede asylum and housefrau-braided hair, Liv is any mother’s worst nightmare come true. Her movie swan song (Golda was her lying-in-state kiss-off), Ingrid is extraordinary beautiful to gaze at, and if we must endure the excessive closing in on faces, who better than hers to zero in on? Not a particularly good performance, though; one of the many annoyances of the movie is that Ingrid’s character doesn’t have enough ammunition in order to give the alleged truth-revealing bangs any really nasty firepower. Based on our own familial wars, there are plenty of penetrating bullets parents can fire back at their adult children when they start the blame game. But director Bergman isn’t into fair play, he’s into vengeance and incredibility—something Ingrid discusses in her autobiography. He must not have cared, however, because when Liv at the end writes in her letter to mother the following, “I tormented you with an old soured hatred which is no longer real. Everything I did was wrong and I want to ask your forgiveness,” his house of punishing love has collapsed into a Nordic commedia dell’arte. Text COPYRIGHT © 2005 RALPH BENNER All Rights Reserved.